Minnat Lalpuria Rao’s (Minnat) November 5th (2015) visit to Hyderabad wasn’t like her earlier visits. Minnat, Founder-CEO of 7Vachan.com (7Vachan), the online wedding consultant and services aggregator, was flying back to Mumbai from Hyderabad. 7Vachan was a three-year-old company having achieved many milestones overcoming several challenges. Minnat had come to Hyderabad for a meeting with her business advisors. During her flight, her mind was preoccupied with the discussion she had with her advisors – focusing on the company’s future course of action. Minnat’s mind was preoccupied with two major aspects of her business – garnering the trust of its customers and having recently launched wedding photography as one of the wedding services vertical, bringing 1 lakh photographers onboard 7Vachan. While garnering and maintaining trust was a continuous process, Minnat was trying to figure out a way to onboard the wedding photographers in India to become their source of orders online and serve as their management software. Providing the customers a choice of 1 lakh vendors (photographers) was one of the many things that 7Vachan was trying to do in an attempt to simplify the process of an Indian wedding while at the same time tapping the huge Indian wedding market which was still quite unorganized but offered tremendous business potential. I. What are the new business opportunities that have emerged with several paradigm shifts in the way Indian weddings have been performed over the last few years? Analyze the changing landscape of the Indian wedding industry. II. 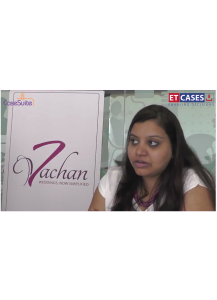 Based on the information provided in the case study, analyze 7Vachan’s business model. Does the new business vertical – photography – complement and sustain its business model? This case study highlights the importance of digital marketing for online startups working on limited budgets. In the backdrop of metamorphosis of Indian wedding industry, the case study narrates Minnat Lalpuria’s entrepreneurial story. Further, it features 7Vachan, the Wedding Consultant’s and Wedding Services Aggregator’s growth story and analyzes its business model and the challenges thereof. Photography was one of the first services vertical to be launched on 7Vachan. How does 7Vachan’s photography vertical complement its business model? After the launch of its photography vertical, 7Vachan was faced with the dilemma of how to have 1 lakh photographers onboard. Can digital marketing help it bring its aspirational number of photographers on board? • Digital Marketing Course/Module: To understand how various components of digital marketing – SEM, SMM, content marketing and display marketing – can be stitched together to offer a compelling marketing proposition to a digital startup. This case study is an attempt to discuss the importance of a coherent digital marketing strategy for an online startup, 7Vachan.com (7Vachan). Minnat Lalpuria (Minnat), the Founder-CEO, conceptualized and launched 7Vachan, a wedding services consultant and aggregator in 2012. Driven by the mission of being the one-stop-shop for Indian weddings across the globe, 7Vachan offered a broad portfolio of services - venues, professional wedding services (such as photographers, makeup artists, decorators, etc.) and wedding products (such as wedding rings, gifts, invitation cards, etc.). Having launched its wedding photography services vertical towards the end of 2015, Minnat and her team faced the dilemma of how to bring the professional wedding photographers on board 7Vachan. After internal discussions, the team zeroed in on using the online channel, as against the offline channel, marketing 7Vachan as an online platform to the professional wedding photographers. What could be its digital marketing strategy? At the same time, Minnat also had a larger dilemma in mind - how to sustain customers’ and vendors’ trust in 7Vachan as an online wedding consultant and aggregator? Digital Marketing Course/Module: To understand how various components of digital marketing – SEM, SMM, content marketing and display marketing – can be stitched together to offer a compelling marketing proposition to a digital startup.